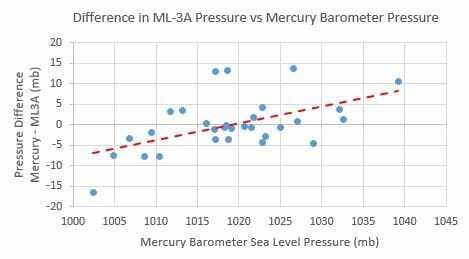 For the month of December 2016 I analyzed the accuracy of my Friez ML-3A microbarograph by comparing its recorded values with values from my mercury barometer and US National Weather Service (NWS) values from O'Hare Airport near Chicago, Illinois. O'Hare is 22.7 km WNW of my location. I set the microbarograph to sea level pressure and calculated sea level pressure from the local pressure measured by my mercury barometer. Values were determined once-per-day near midday. The average drift rate of the ML-3A error compared to the mercury barometer is upward 0.14 mb per month. The scatter of the data (ie, the size of the error) increases in the second half of the month. 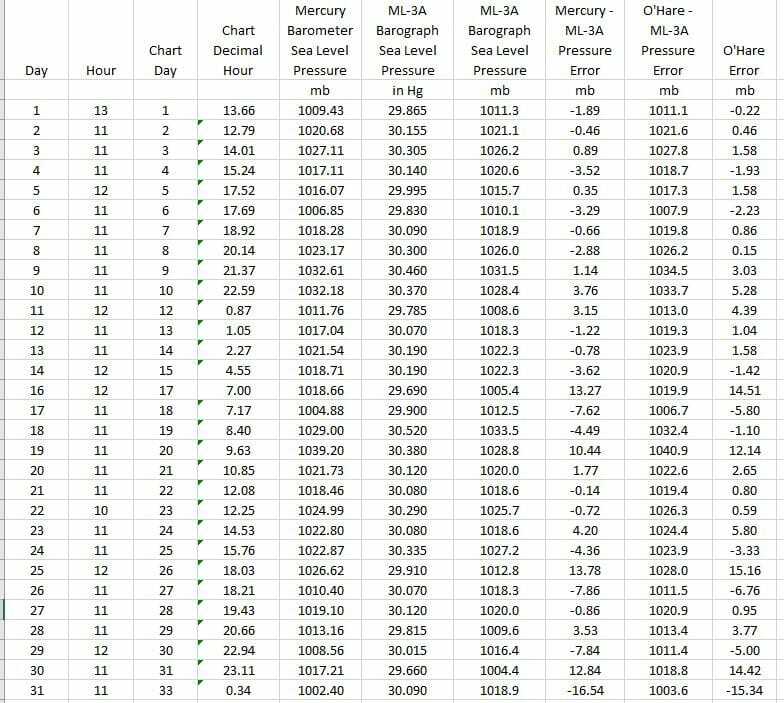 This isn't obvious in the evaluation of mercury barometer data vs O'Hare data which may be found here. My first thought was that the 'chart time vs actual time' was wrong, but I checked and re-checked it and it looks right. I just don't understand how the microbarograph error could be different during part of the drum rotation. The amount of error depends on the barometric pressure measured by the mercury barometer. The average increase in error is 0.41 mb per mb of barometric pressure. This suggests that the ML-3A microbarograph response is distinctly non-linear. ​I checked to see if the Bendix 15621 chart has the right scale for the ML-3A. My ML-3A came with a very sun-faded US Army ML-236 chart from 1945. The 1945 chart has the same pressure scale spacing as the Bendix 15621 chart. This comparison shows the same behavior, except that the microbarograph error trend line is shifted about 1.5 mb higher. The reason for this difference is analyzed in the 'Mercury Barometer Data Check' which may be found here. The average drift rate on the left chart is upward 0.059 mb per month, it's lower because of this 1.5 mb shift in the data. 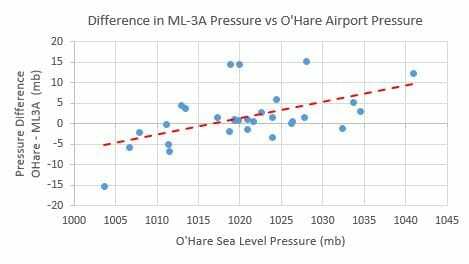 The average non-linearity of the ML-3A data is 0.40 mb per mb of barometric pressure compared to O'Hare data. My conclusion is that my ML-3A microbarograph is very non-linear. It's accurate near 1020 mb but the error increases as the pen goes higher or lower. One potential cause is that the instrument has dashpots to damp out pen movement. My dashpots are filled with a 50% blend of Belfort dash pot oil and mineral oil. It was suggested to me that the Belfort oil was too viscous. I may drain the dashpots for February data collection and fill them with 100% mineral oil to see if that improves linearity. 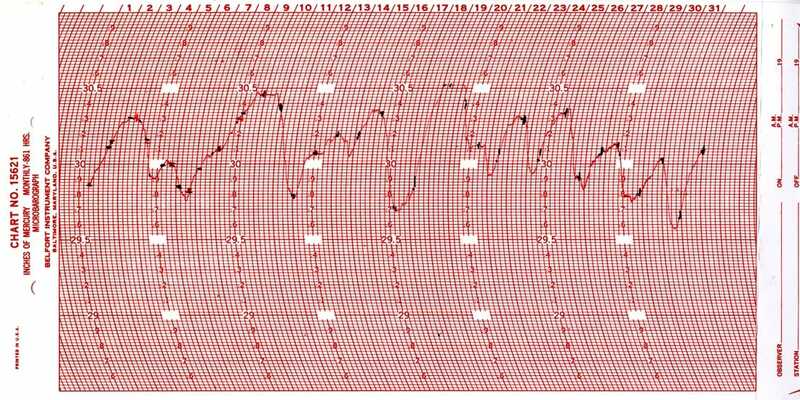 The rapidity with which the barometric pressure changed in December may also have an effect as the pen may lag behind in rapid pressure changes. A second Friez ML-3A microbarograph with the original 4.5 day clock and charts. All of these instruments except the ML-3A have 7-day clocks and use 7-day charts.